The four digital video works on this disk involve an intense and dynamic exploration of colour mixing, phasing tone rows, and illusions of movement. 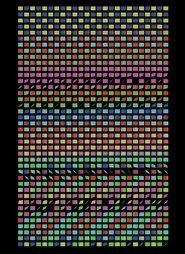 Colour Bars (2004) refers to the ordinarily static television test signal image, which has provided the colour palette for each of the subsequent 'colour field' pieces. New Ratio (2007) works through off-set permutations of standard and wide-screen aspect ratios. Iris Out (2008) is composed of single frames from reformatted sequences of expanding or contracting irises. In Vice Versa Et Cetera (2010) ten variations of four transitions transform the screen from one field of clashing complementary colours to another. An additional feature of the disk is a three-screen version of Iris Out, a format which bounces back the gaze of the viewer in triplicate. The nature of these works evokes the lineage of abstract cinema, and the structure of each piece is highly refined. The impression they make is unique and unaccountable. Three leaves of A5 card (red, green and blue) folded, cut and sequenced to produce apertures that reveal slices of contrasting primary colours. My wife stormed out of the room when I began watching these-be advised that the "flicker" nature of these four are not for everyone.I enjoyed them, but won't watch them regularly.